This is one of the three Pohaniec daughters on my site. She is Philippa and was owned by Slängsboda. In 9th grade (I was 15 yrs) I did my work experience at Slängsboda. I lived there for two whole weeks... heaven for a horse crazy girl! I'm still very grateful to Louise Wale and her family for letting me come there. I actually went there a couple of years later for a week when I had a break from school. Philippa is a beautiful mare in her own right but she has beautiful babies too. Shown once in Stockholm she was Champion mare with 94,6 p. She is the dam of four stallions: *Fynd, *Falk, *Ferrari and Fidelio. *Fynd was reimported to Sweden and was a very nice and talented stallion. She is also the dam of three mares exp USA. She comes from the mare line of Ukrainka, a Saklawi born ca 1815 at Slawuta. The line was decimated after World War II and has continued chiefly through the illustrious Forta. This is a racing family of high merit but has also left horses of exqusite beauty, especially when crossed with Negatiw-bred stallions. Forta's granddam Jerychonka was born at Gumniska, a stud that was heavily into racing and that had imported some racing stock from France, among them Bad, the dam of Bad Afas 1940 and Zmora 1937. When bred to the French stallion Nedjari, Jerychonka 1909 produced Porta 1931, the dam of Forta 1955. Porta had another daughter, Zbroja 1937 by Kartoum who was lost after producing one filly, Europa 1944 by Witraz. Europa left a small family in Germany. The Gumniska horses managed to survive for the most part of the war, under German rule. When the Russians came closer, it was decided that the stud would be evacuated to western Poland. When the horses had arrived in Poznan they got caught between German and Russian armour troops. Almost all horses died, among them descendants of the French and desert imports as well as Porta. Forta proved to be a good broodmare with amazing longevity, not uncommon in this family. 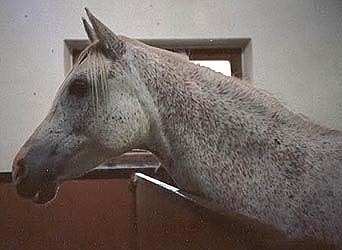 She had 20 foals in 20 years and lived to be 27 years. All her daughters (10) has been used in breeding programs around the world. Of her sons, 8 have been used at stud. Her 1954 daughter, Forsycja by Como, was the dam of *Fuksja 1961 by Anarchista imp Sweden. At Blommeröd she left six mares, among them *Finisia by Abu Ali, and one stallion. *Finisia left two daughters before her exportation, Philippa and Filmia by Madar.